Oh, the things you can find if you don’t stay behind! 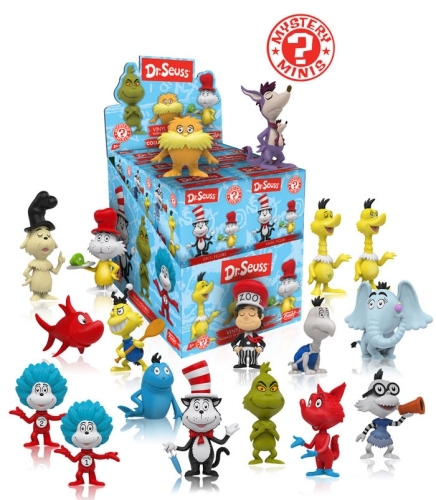 Funko Dr. Seuss Mystery Minis Wave 1 features a whole host of characters from Seussville. Issued in the familiar blind-box format, a few of the Funko Dr. Seuss Mystery Minis subjects resemble their larger Funko Pop Dr. Seuss figures, albeit standing in a different pose, including Cat in the Hat, Fox in Socks, Horton, Sam I Am, and Sam’s Friend. Additionally, several memorable illustrations receive a debut Funko makeover, including the Lorax, The Grinch, the Mayor of Whoville, and Yertle the Turtle. Packaged to appear alike, collecting the entire Funko Dr. Seuss Mystery Minis set can be challenging. This is especially true given that there are over 20 options to track down and only a dozen boxes per case. Also among the many figures to find is Cat in the Hat (tipping his hat), the Cat in the Hat Fish, and White Fish, which are each Barnes and Noble exclusives. While every figure stands approximately 2 1/2” tall, Lorax and the fish versions are noticeably smaller. Individual odds for the Funko Dr. Seuss Mystery Minis are noted below.